Sometimes my La Pavoni Professional ends up looking like this after pulling a shot of espresso. It’s dirty and obviously needs some cleaning, but all that is mostly cosmetic. The inside of the boiler however is looking like it needs a bit of attention too. As you can see there is quite a bit of calcium buildup on the heatingelement (the coil at the bottom) and the walls of the boiler. There is however one very important other part that you cannot see but is very affected by calcium buildup, the pressostat. The pressostat measures the pressure inside the boiler as the water temperature rises. If the accessport to the boiler clogs up with calcium the pressostat can no longer get a clear reading on the pressure in the boiler which can cause the boiler to overheat, which is quite dangerous. It’s also possible that a false reading will shut the heatingprocess down prematurely, which prevents the water from actually getting up to operating temperature and will make your espresso’s sour and weak. There are a lot of ways to descale, some people use vinegar (diluted or undiluted) but a common practice is to use pure citric acid. You can buy it at most drugstores, but be sure to check that it is purely citric acid and doesn’t contain anything else! A little heads-up, do not eat or drink it, get it in your eyes, open wounds or anything else because the stuff is not good for you. If you accidentally spill it on the chrome of your La Pavoni, wipe it off immediately because citric acid will damage chrome (not instantly but it certainly doesn’t do it any good)! Keep a couple of paper towels handy. Keep your workstation, tools and accessories clean. Anyways, enough with the lecture, lets clean. I emptied the boiler and mixed a liter (4 1/4 cup) of handwarm tapwater to 50 grams (1 3/4 ounces) of citric acid powder. Then, using a plastic or stainless spoon, stir the whole thing until the powder has fully dissolved into the water. I poured a little bit of the solution into a little glass bowl to descale the single basket. Normally this isn’t necessary if you clean it after every shot pulled (like you should) but because it’s stainless steel i figured i’d give it a go. Pour the rest, carefully, into the boiler. After filling the boiler put the boiler cap back on and switch the heatingelement on. When the pressure starts rising (or when you hear the pressure-relief valve hissing if you don’t have a pressure gauge) switch the machine off and let it sit for a while. Depending on the amount of calcium buildup that can be anywhere from half an hour to 3 hours. 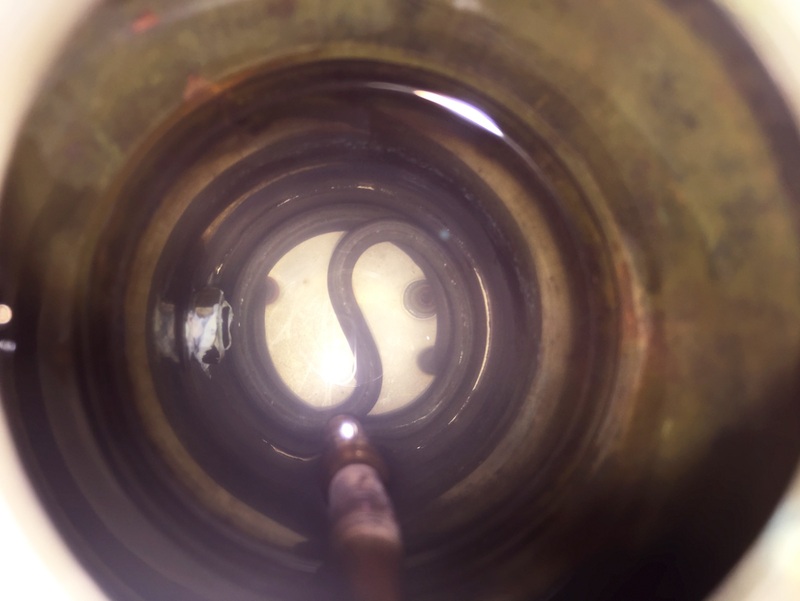 If you feel inclined to check if the progress make sure there is no residual pressure left in the boiler by opening the valve to the steamwand. The inside of the grouphead on the La Pavoni Europiccola and Professional is also chrome plated. If it comes in contact with the citric acid the chrome will start chipping and flaking off. 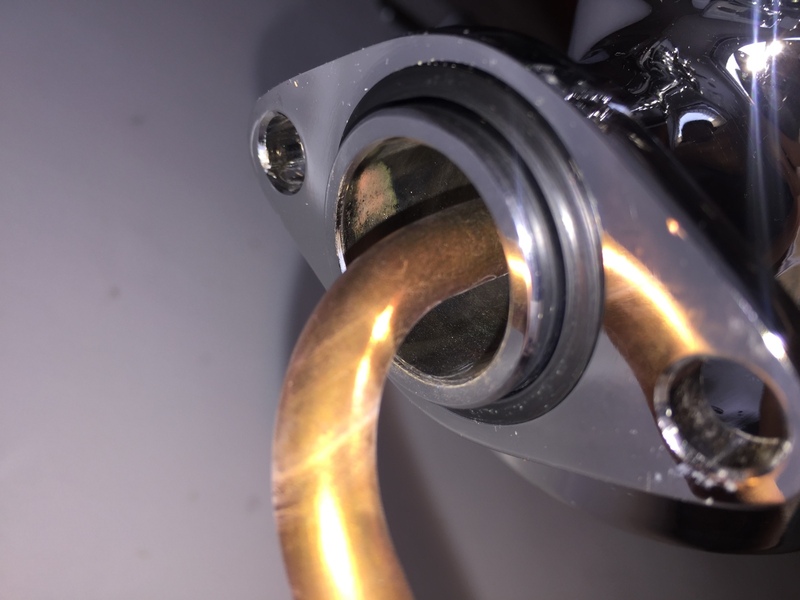 The surface inside the grouphead is where the piston and its rubber seals slide along, if that surface is damaged the seals will eventually start leaking and simply replacing them will be nothing but a temporary solution. Eventually you will have to remove the grouphead and have it re-chromed or replaced, not cheap. While the citric acid solution is doing its job i cleaned the chrome body, base and grouphead with a damp cloth and washed the portafilter and driptray. One other important part that you will want to check on regularly is the bottom of the grouphead. La Pavoni owners will know that it takes a lot of tinkering to figure out the correct grindsetting, amount of grounds, tampingpressure, grouphead temperature, pressure on the lever and who knows what else. Every so often we mess up and get the infamous portafilter sneeze, which means there’s still residual pressure left in the grouphead after pulling a shot that we have no way of relieving (other than to leave it alone for a while). The portafilter sneeze creates an enormous mess and while most can be clearly seen, chances are you’ll forget the grounds in the bottom of the grouphead. I draped a damp cloth over the base and ran a brush through the bottom of the grouphead until it was clean. As you can see there was quite a lot in there, even though i clean it regularly. I check the boiler every 15 to 30 minutes to see if the calcium buildup has disappeared. If it has, as you can see in the pictures, i empty the boiler through the top. Then i fill it about 1/3rd, put the cap back on and shake it like a cocktailshaker. After a minute or so i empty the boiler again through the top and put some fresh warm water in it. I do that 2 – 3 more times, until i am sure all the contaminants and flakes of calcium are out. Do it twice more if you have to, you can’t do this too much. Make sure the lever stays down at all times, we don’t want water all over the kitchen. Now i’m satisfied with the inside of the boiler i still want to purge the grouphead tube, the grouphead and the steamwand by filling the boiler with water and heating it the way i normally would. When the boiler has reached operating temperature, i switch off the heatingelement and put a little kettle under the grouphead (on a piece of cloth to minimize the risk of damaging the chrome) and in short bursts empty the boiler until the waterlevel in the sightglass almost touches the bottom of the sightglass. I then let the La Pavoni cool down and do the same thing a second time, maybe even a third time if i’m not satisfied with the clarity of the water coming out of the grouphead yet. As you can see i had the portafilter with a single basket locked in the grouphead, if you don’t have a bottomless portafilter do not use it while purging the grouphead, the water will shoot out of the spout(s) and end up on the walls left (and right) of the machine, not in the kettle. The only reason i locked it in was because i wanted to flush some water through the basket that had been in a citric acid solution as well. Well the conclusion is pretty simple, the tank is clean and at exactly noon i finally had my first espresso of the day. It also took me a lot longer to write this post than i imagined it would at first, but if it helps anyone that’s all i care about. For now have fun tinkering with the various variables that make or break your espresso shots on a freshly cleaned La Pavoni, i know i will. It’s helped me. Thank you for your time and effort, Sebastiaan! Awesome =) Warms my heart! Thank you very much! I am cleaning my machine right now following your instructions. Great article! Just a warning to be very very careful when using pure citric acid. It is not buffered and when I tried it on my La Pavoni Professional, I had disastrous results. That’s because the inside of the boiler is also chrome-plated brass. When I used a very diluted citric acid solution (1tsp/liter) and left it for 1 hour in hot water, it stripped all the chrome plating off the boiler, now instead of chrome, it is exposed orange brass. This is very bad, as it’s more vulnerable to corrosion than the chrome plating. Also, if you fill the water up to the top, the top part of the inside of the chrome plated group head will also be exposed to the citric acid, and can strip that as well. This also happened to mine. I highly recommend using a professional descaler instead. There are a very small number of manufacturers that had a short amount of time where they chrome plated the inside of boilers too, that’s correct. If you see any sort of chrome inside the boiler (always look before you act!) then don’t use citric acid. As I mentioned in the article, citric acid and chrome do not get along and chrome will lose that battle every single time. Now, that said, boilers that have been chromed on the inside are rare and a bad practice to begin with. Usually it’s being done to cover up small blemishes. But the real problem with chrome inside a boiler is that eventually it’ll start flaking off. Those flakes will then end up in the water inside your machine, traveling towards your grouphead or, even worse, being shot out of the steam wand when you’re steaming milk for your cappuccino… The grouphead by the way, is not chrome plated on the inside. As for the brass corroding more easily, that’s really not an issue at all. Yes, if you leave it bare (ie. little or no water contact), don’t clean it, and generally neglect it then yes eventually you’ll see some corrosion. But the best part is that you can get rid of that corrosion using some citric acid, although it’ll take a little longer. The brass itself is not harmful at all, won’t influence the taste of the water or anything else. Having flakes of chrome in your steamed milk or coffee however is very unhealthy. Thanks so much for your reply, I do have a ‘transitional’ model with the pre millennium group/piston and the rest millennium parts. The chrome didn’t flake off, it just dissolved into microscopic shimmer. And you put my mind at ease about the corrosion factor. You mentionedis the grouphead is not chrome plated on the inside but your article said “The inside of the grouphead on the La Pavoni Europiccola and Professional is also chrome plated.” Anyway, I’m pretty sure mine is, as the bottom half of the neck (where the group meets the boiler) is now a brass color and the part that the citric acid didn’t touch is still chrome. I followed the descaling videos from seattle coffee/orphan espresso and I was a little upset that none of them mentioned anything about the citric acid being corrosive to chrome. That is why your article is awesome and I wish I read it before descaling my unit. Despite everything, my shots are much better now that I’ve descaled/cleaned everything, so I do highly recommend it, just be careful with the chrome parts! Chrome in contact with citric acid will dissolve, but under normal circumstances chrome will flake off. As for the grouphead, you got me there. The grouphead is partially chrome plated. The outside obviously, and part of the inside too. The opening in the boiler that the grouphead is attached is actually not a passage way directly into the grouphead. In fact that opening is closed off in the grouphead and isn’t chrome plated (which is what I meant). 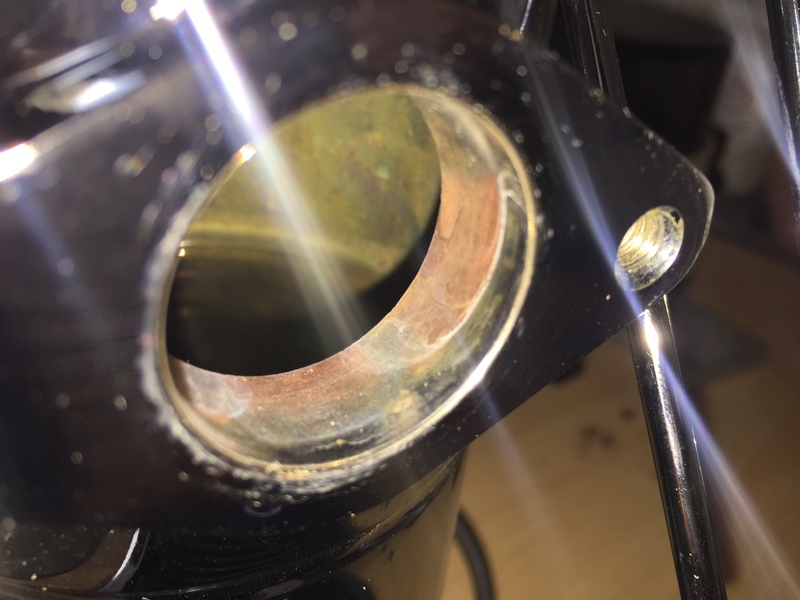 The water from the boiler enters the grouphead through a copper riser tube that you can see entering the boiler through that opening. Once the water in the boiler heats up the built up pressure will force the water up the riser tube into the grouphead. 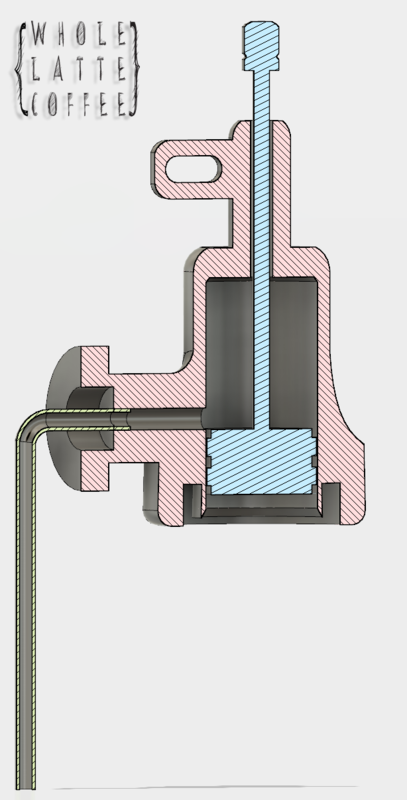 For that to happen, the piston (and lever) need to be in the up position, otherwise the riser tube is blocked off from the other end and the water won’t rise. As long as you keep the lever down during the time you have citric acid in your boiler none of that will make it into the grouphead itself. Now, inside the grouphead where the piston moves up and down there is a chrome plating. That chrome plating is there to create the best possible seal with the rubber seals. A machined brass surface would work too but isn’t nearly as smooth as a chrome plating. Not only would that cause a loss of pressure, it would also wear down the rubber seals faster. By the way, keep an eye on the remaining chrome inside your boiler. The chrome and interface layers (the layers between the chrome top layer and the brass itself) have been compromised and as a result are more prone to flaking. At the very least keep an eye on the remainder of the chrome and in particular the edges. The cavity in the left side of the grouphead matches up against the opening of the boiler. 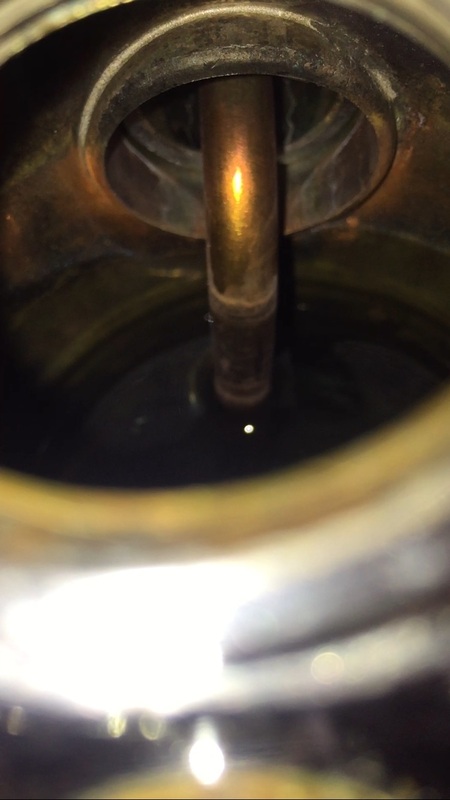 However that hole is closed, you can see the riser is what actually provides a pathway for the water to flow into the actual piston chamber of the grouphead. As long as the piston is down there is no way for the water to flow through that area. Thank you for the diagram. 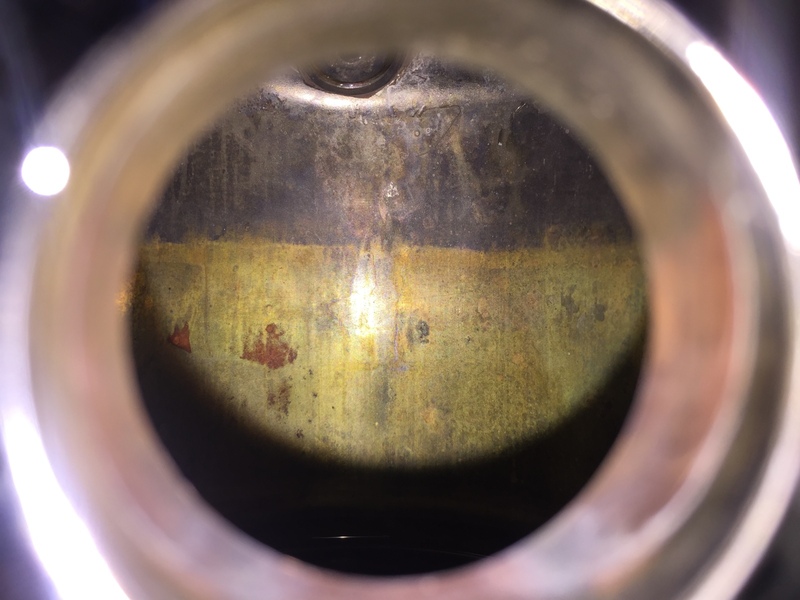 I took some photos of the citric acid damage inside the boiler and shaft. Please let me know what you think I should do, as there is still limescale I need to remove but now I am afraid…Thank you! Ah, what you have inside that boiler isn’t actually chrome. The photo where you see the clear line shows brass below the “line” and a nickel plating above it. Nickel plating is usually used as an interface layer between the base metal and chrome or just to hide small blemishes. The darker or red spots on the brass are most likely copper sediments that settled on a slightly rougher part of the boiler. Nothing to worry about. Both copper and brass are food safe. Nickel (unless you have an allergy to it, but you would’ve known by now ;)) is mostly safe too. However, much like chrome, nickel will flake when compromised. In your case I’d say that is very much the case. Personally I’d reattach the entire grouphead, piston and lever included, and fill the boiler almost to the brim with citric acid. You can use a more diluted mixture since you don’t need to have it too aggressive as there is barely any scale left from what I can tell from the pictures. Turn on the heating element, let the boiler warm up so it’s warm to the touch and make sure it doesn’t overflow. Turn the heat off, unplug, and let the citric acid remove the rest of the nickel. When you’re comfortable with the results, empty the boiler, and rinse it several times with clean tap water. Run plenty of water through the grouphead too. Ninja edit: I’m not entirely sure what I’m seeing in the photo of the back of the grouphead though. It could be that the inside of that is actually chrome plated. However, there’s one spot just left of the riser tube where it seems that the chrome plating, nickel plating is gone to the point where the bare brass is visible. Not a big deal but you’ll want to get rid of the rest of that plating too so using citric acid will help there as well. Hi Andre, there’s a good chance that any descaling method would’ve resulted in this outcome. The scale build up inside the boiler might have been sufficient to keep the old seal from leaking. There quit a big gasket that seals the bottom of the boiler and if that needs replacing I’d suggest handing it to someone who’s done it before since there are models that have plastic collars that break very easily. Thank you for the info. My machine is from 2008 but i’ve purchased new last year since my old PC-16 was too beaten up and to fix it would cost me almost the price of a new one. Anyway, I’ve done the gasket replacement before but I would rather to hand the machine to a professional. The thing is I live in Brazil and there’s no service for it down here. I’d have to send to the US or Europe as I’ve done with my old one. Too much work and too much time. I think I’ll do it myself. God help me. Thank you for the reply. Well if you’ve done the replacement before you at least have an idea of what you’re doing. Shipping your espresso machine for service is never fun. It takes time and you never know what’ll happen to a package. Shipping something out of country only adds to that. All that aside, if you’ve had the machine for about a year though and it got a new seal since then, it really shouldn’t be leaking already. You might want to fill up the boiler, let it warm up and keep a close eye on the bottom of said boiler. That way you at least know exactly where it is leaking. Just make sure you unplug it before tilting the machine to gander a look!